This Holiday season, Paul is very excited to be playing Scrooge in A Commedia Christmas Carol with Faction of Fools Theatre Company. Opening Nov. 29! GuyLoki Films' Steampunk vs Superheroes premieres at the Philadelphia Film Festival in September. See Paul as cyborg supervillain, Steamborg! Fringe time! 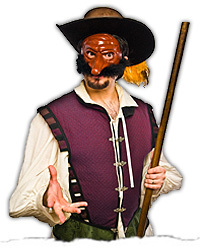 Come see Faction of Fools' 3rd Annual “Fool For All”: Tales of Marriage and Mozzarella. Paul is one of six directors, one of 40-plus actors, and the one and only emcee! On July 18, Paul will be performing with the Clown Cabaret as part of the Over the Line festival at Roundhouse Theatre! Paul is proud to be a part of the landmark production of The Servant of Two Masters at The Shakespeare Theatre Company. Now extended through July 8th!